We use both the execute function and the filename property of the OpenDialog and SaveDialog to handle the files. The filter property is handy for showing (in this case) only the text files and for adding the .txt extension if necessary. 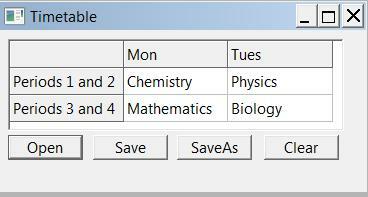 The SaveToFile method of the string grid saves the contents of all the cells as an xml file. The essential code of the files needed for program FileDialogDemo follows. You can download the three files for Lazarus in file_dialog_demo.zip. //Clear cells from Col 1, Row 1 to Col 2 Row 2.